^ Rose, Mark. A New Species?. Archaeological Institute of America. July 29, 1997 [2007-11-30]. ^ Images of Mauer 1. [2006-07-14]. ^ Czarnetzki A, Jakob T, Pusch CM. 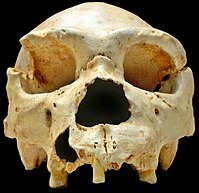 Palaeopathological and variant conditions of the Homo heidelbergensis type specimen (Mauer, Germany).. Journal of Human Evolution. April 2003, 44 (4): 479–495. ^ The first Europeans - one million years ago. [2007-12-01].